These managers must have a strong background in information technology with a clear understanding of the challenges of information security. They require excellent analytical and problem-solving abilities to identify and fix security risks. To build understanding and awareness of security issues throughout the organization, they must have excellent communication and presentation skills. They also need good team working skills to develop security solutions in collaboration with other information technology professionals. Information security managers assess the organization’s security measures, such as firewalls, anti-virus software and passwords, to identify any weak points that might make information systems vulnerable to attack. They may carry out simulated attacks to test the efficiency of security measures. They also prioritize security coverage to ensure that strategically important data, such as commercial information or personal data, receives the highest levels of protection. To minimize risk, these managers develop policies that encourage secure working and protect data. They give employees and managers different levels of access to company data based on seniority and job function. They also provide training for employees, explaining security risks and demonstrating good practices, such as using strong passwords and protecting data when they use mobile devices outside the office. Managers set up procedures and automated processes to monitor the status of computers and networks. If the monitoring system detects unusual patterns of behavior, managers must respond quickly to determine the cause and deal with any threat. They also analyze reports generated by the monitoring system to identify trends that might indicate a future risk. Information security professionals earned a median wage of $75,660 in May 2010, according to the Bureau of Labor Statistics. Employment in this profession is projected to grow 22 percent between 2010 and 2020, which compares to a projected average growth of 14 percent for all U.S. occupations. All Students Will Receive A Certificate As A "Certified Information Security Manager". National Cyber Security University is recognized by governments and corporations around the world. Offers "Viewpoint" essays to provide a range of commentary that illustrate interesting topics or share personal experiences--providing students with real-world examples. 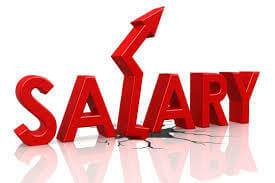 Six-figure salaries are the norm for Information Security Managers in the United States, with median pay hovering around $108K per year. Cash earnings of Information Security Managers can occasionally include $20K each in bonuses and profit sharing proceeds; this strong performance component causes pay grades to stretch from approximately $73K to almost $153K. Geography is the biggest factor affecting pay for this group, followed by the company and years of experience. Job satisfaction is reported as high by the vast majority of workers. Medical and dental benefits are awarded to a large number, and most earn vision coverage. Men account for the majority of Information Security Managers who responded to the questionnaire — 88 percent to be exact. Participants in PayScale's salary questionnaire provided the particulars of this report. 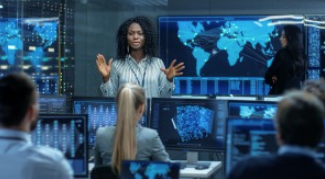 While not commonly seen, Information Security Managers who transition into a Chief Information Security Officer position may see a rise in pay. The median salary for Chief Information Security Officers is $157K per year. The most common promotion for Information Security Managers is an Information Security Officer position, which usually brings in $87K a year. Another standard transition for Information Security Managers seeking advancement is to assume a Director of Computing & Information Technology Security role, where pay is often $116K. Create and execute policy and audit plans, and identify security risks and operation needs. Lead security training and communicate policies. Manage security testing platforms, including leading forensic investigations and mitigation procedures. Review configuration and updates to ensure software and infrastructure are protected. Assist in migrating information assets and environments into compliant, secure systems. Get This Course For Less. Download The "National Cyber Security University" App!